I used to do an awful lot of work illustrating educational textbooks for schools. Here's one from the days when I used to splash acrylic paint about with reckless abandon. 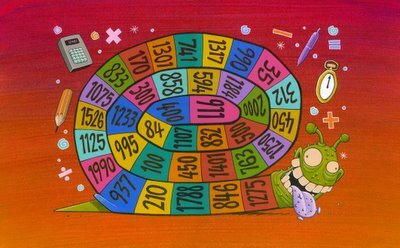 I have absolutely no memory of what it was for, apart from a vague awareness that the snail was supposed to be demonstrating some sort of mathematical principle. Or why you should avoid certain kinds of chemicals, I'm not sure. I would have guessed at it being something to do with the Fibonacci sequence (which relates to spirals and snail shells and stuff I think) only the numbers are all wrong for that. Maybe they're just all the E numbers contained in the fizzy pop that has left the snail looking so wired.